Christian Spiritual Conversation On Saving Faith, For teh young, In Questions and Answers, and A Confession of Faith, of the Mennonites. With Appendix. Lancaster: Printed and Published by John Baer and Sons,	1857. 8vo., full cont. calf, leather label, 309pp. Some light wear, 1" split in upper hinge but in fact near fine. (New York: no publisher,	1949). Tall 8vo., cont. half calf, cloth, 153pp. A near fine copy. In Memoriam John Larkin Lincoln 1817-1891. Tall 8vo., orig. green cloth, 641pp. Near fine. Quaint Corners In Philadelphia. With One Hundred and Seventy Four Illustrations by Joseph Pennell and Others. 8vo., orig. cloth, 506pp. Very good. State of New York A Memorial to Theodore Roosevelt. Authorized by the Legislature February Twenty-First, Nineteen Hundred Nineteen. Sm.4to., orig. brown cloth, 131pp. Spine slightly faded with some wear to the top but certainly very good. Sm.8vo., cont. leather spine, paper boards, 119pp. Name, some light rubbing o/w near fine. The Romantic Story of the Mayflower Pilgrims. And Its Place In the Life To-Day. Boston: L.C. Page & Company,	1911. First edition. Tall 8vo., orig. light blue cloth with pictorial design of a boat in white, gilt and dark blue, xiv, 192pp. A fine copy in the attractive publishers cloth binding. Boston: L.C. Page & Company,	1918. New Edition, With Explanatory Note. Tall 8vo., orig. light blue cloth with pictorial design of a boat in white, gilt and dark blue, xxii, 192pp. Spine slightly darkened, a touch of rubbing o/w a near fine copy. Five Years In The Alleghanies. New York: American Tract Society,	(1863). First edition. 12mo., orig. brown cloth, gilt decoration on the spine, 206pp. Name on title, spine and perimeter of upper cover faded, o/w near fine. History of the Mormons Or, Latter-Day Saints. With Memories of The Life and Death of Joseph Smith, The "American Mahomet." Auburn: Derby and Miller,	1853. "Second Thousand" (so stated). 8vo., orig. cloth, (viii), 399, (2)pp.ads. Slight foxing, some rubbing, a very good copy. Review of "Spring on Native Depravity." A Critical, Philosophical and Theological Review of A Dissertation on Native Depravity by Gardiner Spring......By a Presbyterian. (pseud). New York: Published and Sold by D. Appleton.......	1833. 8vo., orig. printed wrappers, 64pp. Some occasional foxing, chipping along the spine but certainly a very good copy. Story of an Russian Jewish family's immigration to the U.S. at the turn of the century. 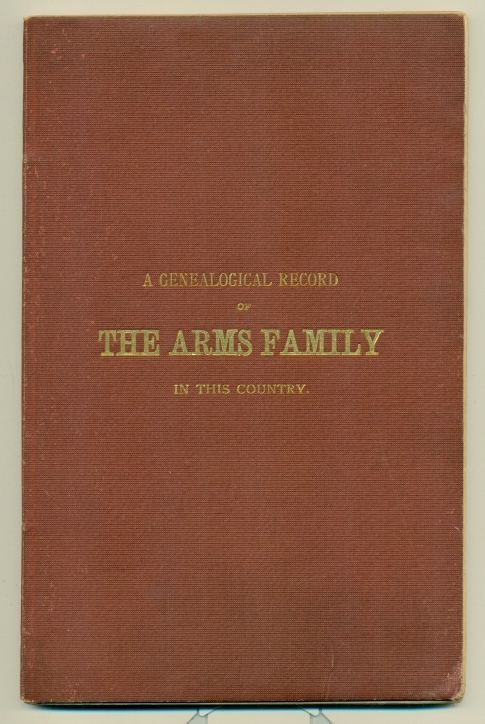 A Genealogical Record Of The Arms Family In This Country, Embracing All The Known Descendants of William First, Who Have Retained the Family Name, And the First Generation of the Descendants of Other Names. Troy, NY: Published by the Author, 1877. First edition. Tall 8vo., orig. flexible cloth boards, 57pp. Ancient America In Notes On American Archaeology. New York: Harper & Brothers,	1872. 8vo., orig. cloth, xii, (13)-299, 8pp.ads. Bookplate, marks on front e/paper, some slight rubbing but still a near fine copy. "....to give a summary of what is known of American Antiquities, with some thought and suggestions relative to their significance....." Includes chapters on Ancient America; Antiquity of the Mound-Builders; Mexico and Central America; Antiquity of the Ruins; Aztec Civilization, Ancient Peru and other matters of interest. New York: Harper & Brothers,	1855. First edition, printing 2--no priority. Tall 8vo., cont. half calf, cloth, iv, 517pp. Some rubbing o/w very good. The American Statesman; Or Illustrations of The Life and Character of Daniel Webster. Designed For American Youth. Boston: Gould and Lincoln,	1853. Sm.8vo., orig. cloth, 334, ads. Spine cocked, cloth worn a good copy only. Boston: Extending Horizons Books,	(1968). First edition. Cloth, 287pp. Near fine in a near fine d/w. The Pilgrim Fathers; Or, The founders of New England In The Reign of James The First. By........With Illustrations. London: Arthur Hall, Virtue & Co.,	1854. Second edition, revised. Sm.4to., full contemporary dark green morocco, raised bands, elaborate gilt compartments, gilt borders on covers, A.E.G., xii, (13)-240, (16)pp.ads. There is a 2" by 2" dampstain on the lower edge extending through two thirds of the books which is mostly apparent on the plates but not extensive, o/w a near fine copy in an attractive binding. Vigilantes. A Chronicle of the rise and fall of the Plummer gang of outlaws in and about Virginia City Montana in the early '60s. Drawings by Charles Hargens. Philadelphia: Penn Publishing,	(1929). First edition, 1 of 250 copies signed by the author. Tall 8vo., orig. brown cloth, 346pp. Rubberstamp and name on verso of limitation page o/w a fine copy.